Acer Jade Primo, the name doesn’t look like anything related to the PC environment. But yes, it is a pocket phone plus PC or a PC which can make calls or whatever. Acer has announced their latest Windows Phone which will run Windows 10, and this is certainly a big announcement at the IFA 2015 to be held in Berlin. The Acer Jade Primo is a phone which can act like a full featured PC when connected to a large display. Confused? Thanks to Continuum- a new feature of Windows 10 that makes it possible. However, there may be certain limitations but surely it will get most of your jobs on PC done. 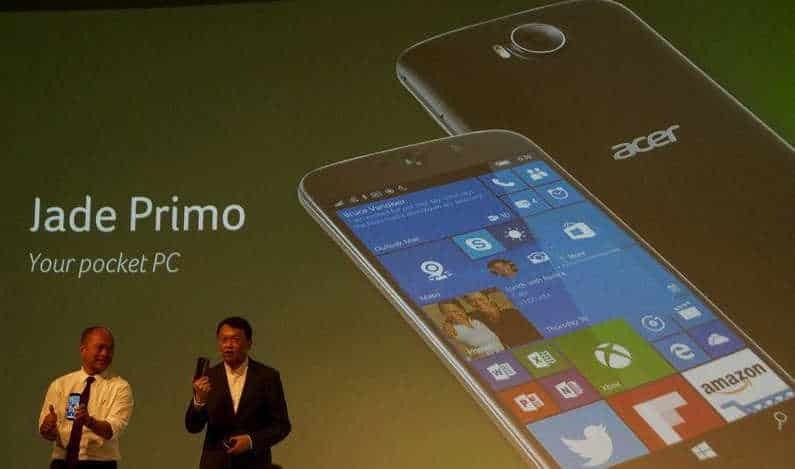 The Acer Jade Primo will be the first smartphone from Acer to work like this. And Acer Jade Primo is a complete package because you will get a keyboard, a wireless mouse and a dock with the phone. In terms of specs, the Jade Primo has a 5.5-inch Super AMOLED display, and the device is powered by Qualcomm Snapdragon 808 processor. The device will bloats of a 21-megapixel camera on the back with a Dual LED flash and an 8-megapixel front camera for video calls and selfie. No details are out about its availability or price, but well we will get them soon, however we may need to wait till 2016 to see it hitting the shelves.